In 1988, the crime rate in the United States rose 400%. Manhattan was converted to a maximum-security prison, with 50-foot containment walls erected along the opposite shorelines of the Hudson, Harlem and East Rivers. Some nine years later, in 1997, Snake Plissken had to get the U.S. President off of the island in just 24 hours. It seems that the streets may have been renumbered since John Carpenter's documentary was filmed. The only bridge across the Hudson is the George Washington Bridge, which is a two-level suspension bridge. Besides, Snake exfiltrated to the east, crossing the Harlem River or East River on the 69th Street Bridge. 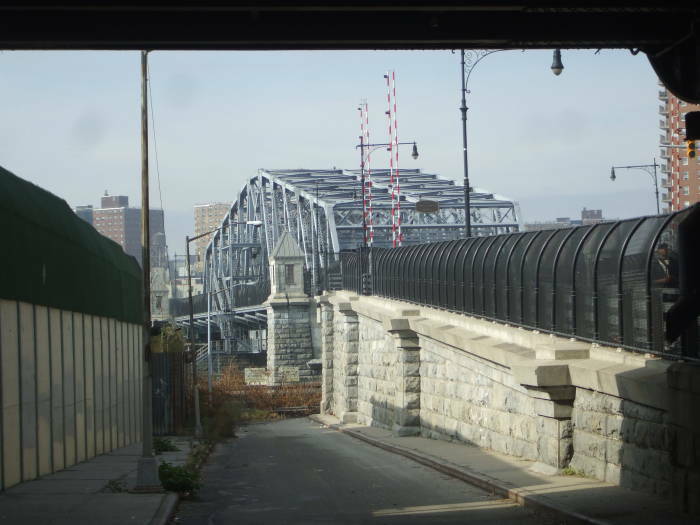 The Queensboro Bridge, also of an inappropriate design, is at 59th Street. The next bridge north of there is a small one at 104th crossing to Ward's Island. The map shown here indicates tunnels in red. But notice the map on the wall behind United States Police Force commissioner Bob Hauk, showing the numerous Manhattan-Bronx bridges like these. 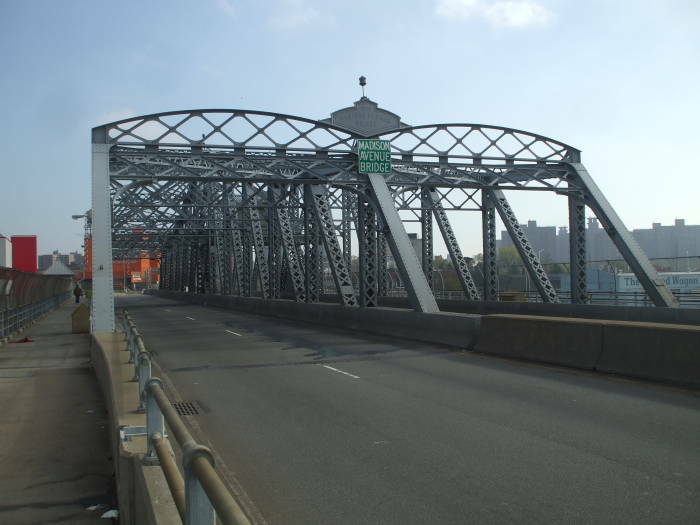 The bridge we're looking for is a steel truss bridge, like what now is known as the 145th Street Bridge. Above we're approaching it from the South Bronx, having taken the #6 train to its 148th Street station. Then we're crossing from the Bronx to Manhattan. 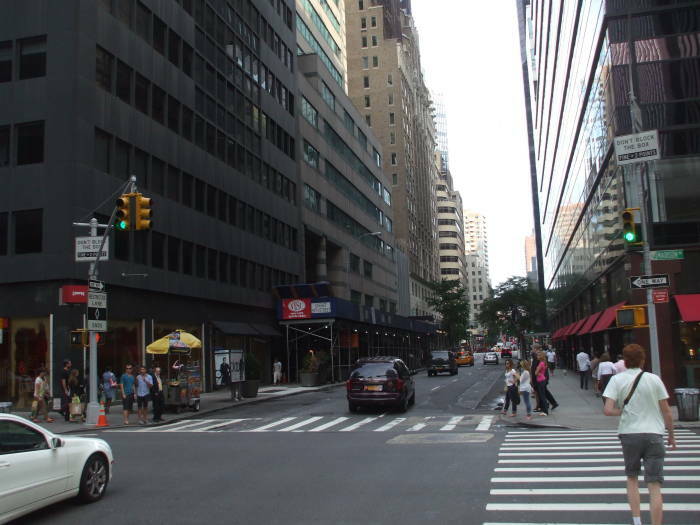 You have to continue a long block east to Malcolm X Boulevard, also known as Lenox Avenue, before turning south. Continue to 139th or 138th Street, turn back to the east, and you can cross the Madison Avenue Bridge as seen below. This page has multiple issues. This page casually mixes fiction and reality. This page contains an excessive amount of intricate detail that may only interest a specific audience. 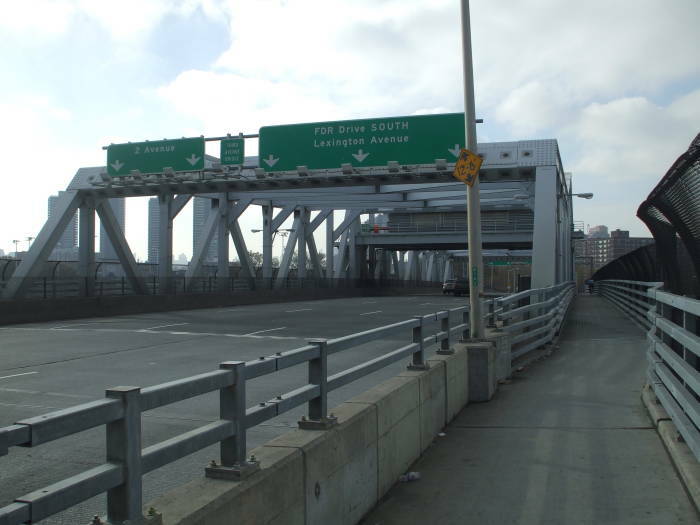 These ramps and bridges joining Manhattan to the Bronx are around the place where, some ten years earlier, Sherman McCoy and his mistress Maria Ruskin became lost en route from JFK Airport to Manhattan, striking and injuring Henry Lamb while being menaced by crack dealer Roland Auburn. Just to clarify the terminology, Maria is clearly Sherman's mistress, meaning that Sherman is Maria's, well, what? Paramour I guess? Not to pass moral judgement, I'm just trying to figure out the proper labels. From there you can make your way through the South Bronx. Take 138th Street east across Grand Concourse to where Morris Avenue joins into Third Avenue. Then return to Manhattan on the Third Avenue Bridge as seen above. 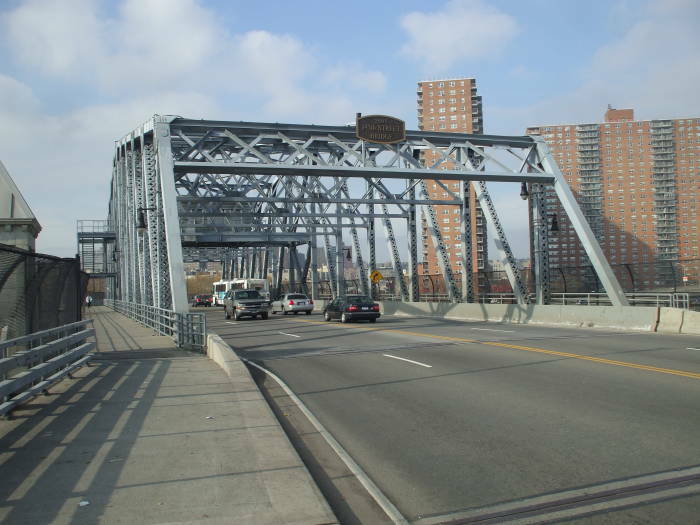 This bridge joins Third Avenue in the Bronx with Third Avenue in Manhattan, where it starts south at 128th Street. Sherman McCoy was trying to get back to his townhouse on Park Avenue around 75th Street, seen below. 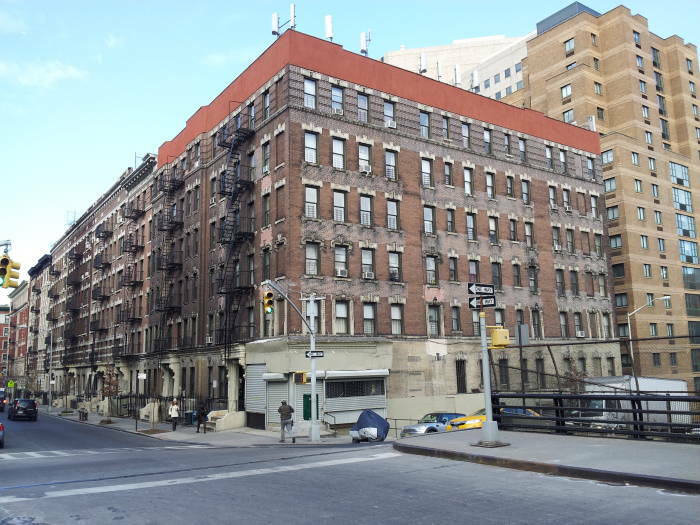 Léon Montana lived here in apartment 6D at the corner of East 97th Street and Park Avenue, at the south edge of Spanish Harlem. It looks like the bodega on the corner has closed since he and Mathilda moved out. 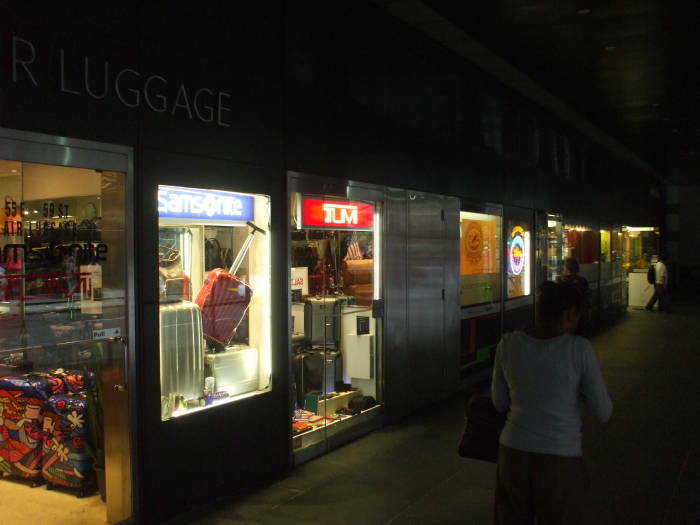 The Harlem Line of the Metro-North rail system emerges here from its underground run under Park Avenue north from Grand Central Station. East 97th Street is the last street to cross over the rail line. The first station on the Harlem Line north of its origin at Grand Central is at 125th Street. The railing and chain-link fence are along the edge of the bridge over the rail line. 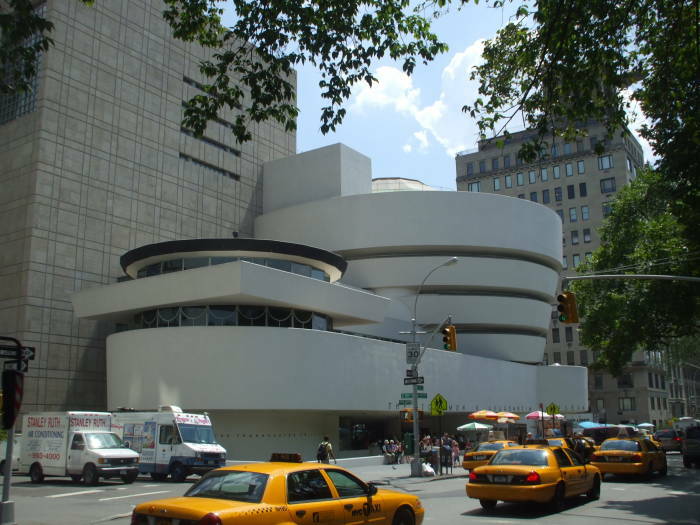 Rookie police officer James Darrell Edwards III once pursued a man through the streets of the Upper East Side of Manhattan and up onto the roof of the Solomon R. Guggenheim Museum, where the suspect jumped off. 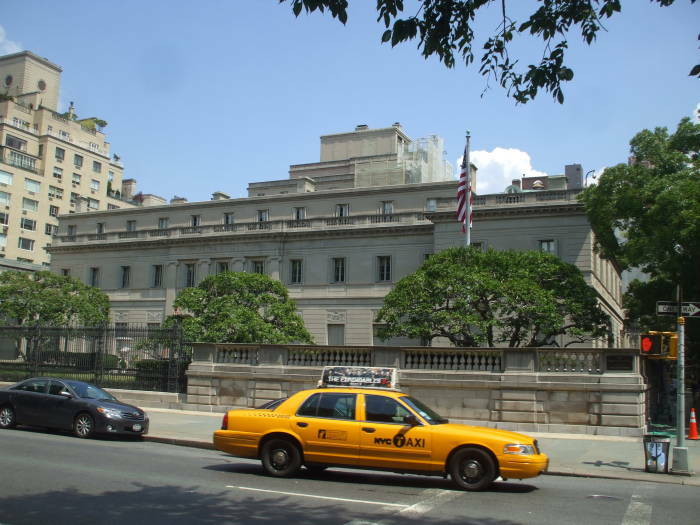 The museum is at 89th Street and Fifth Avenue. 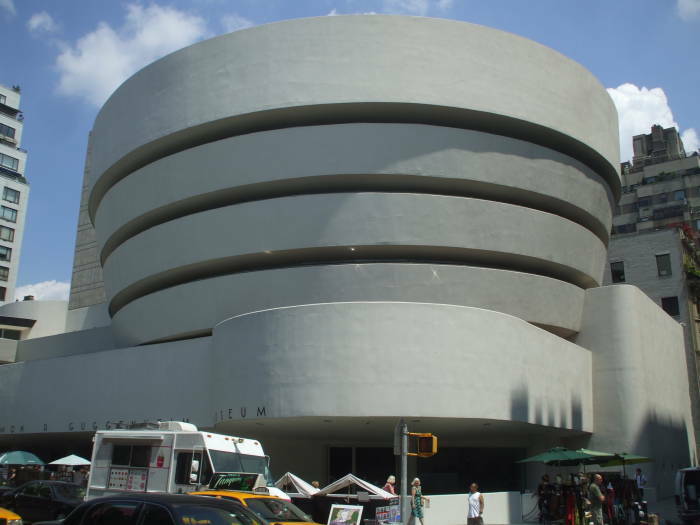 The Guggenheim specializes in Impressionist, Post-Impressionist, early Modern and Contemporary art works. Its gallery is a continuous spiral ramp around a tapering truncated cone shape widest at its top. 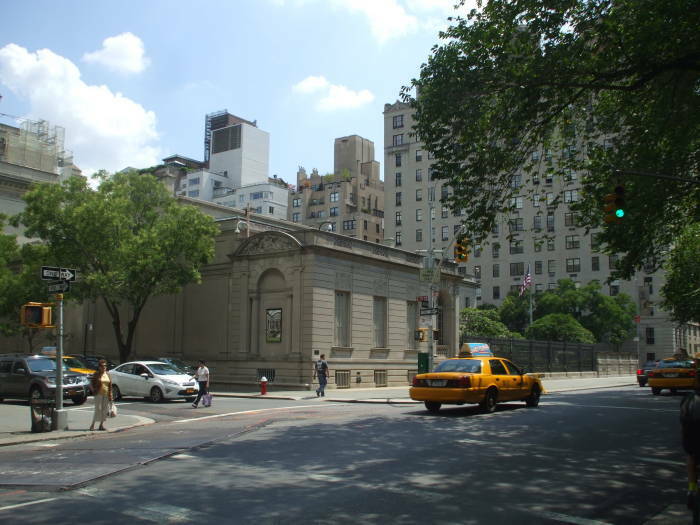 The foundation's first museum was The Museum of Non-Objective Painting, which was based in a rented facility on East 54th Street. In 1943 the foundation asked Frank Lloyd Wright to design a permanent home for the collection. The new museum building didn't open until October, 1959. Like most Wright designs, it is a notoriously impractical structure. It is a difficult building in which to display art, what with the continuously slanting floor and the concavely curved wall surfaces. Restoration in 2005-2008 removed 11 coats of paint from the original surface, revealing hundreds of cracks caused by seasonal temperature changes. 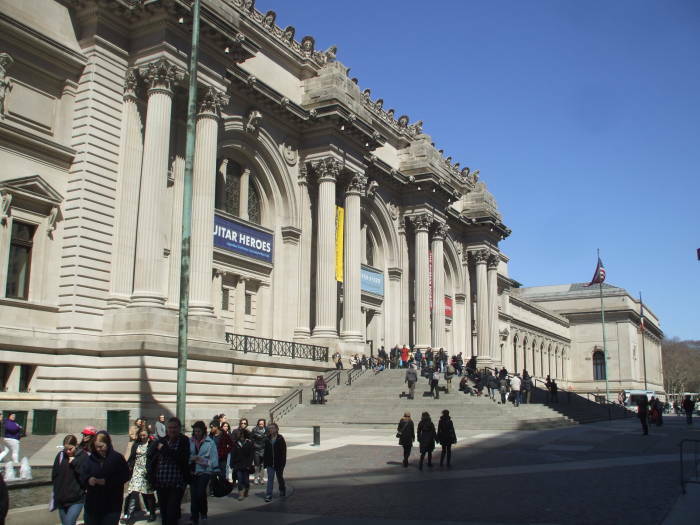 The Metropolitan Museum of Art on the Upper East Side in Manhattan is the largest art museum in the United States. It was incorporated in New York in 1870 "for the purpose of establishing and maintaining in said City a Museum and Library of Art, of encouraging and developing the Study of the Fine Arts, and the application of Art to manufacture and natural life, of advancing the general knowledge of kindred subjects, and to that end of furnishing popular instruction and recreations." The museum then opened to the public in 1872. It has grown to more than twenty times it original size, some ¼-mile or 400 meters long and with more than 2 million square feet or 190,000 square meters of floor space. 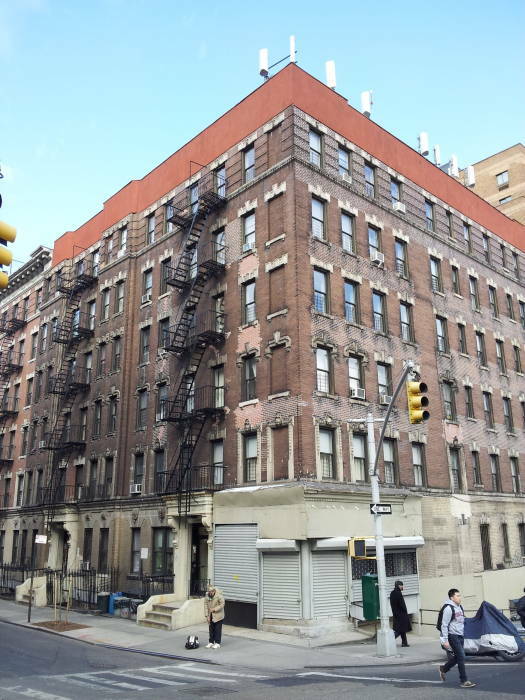 The building itself is owned by the City of New York which contributes utilities, heat, and some of the guardianship cost. 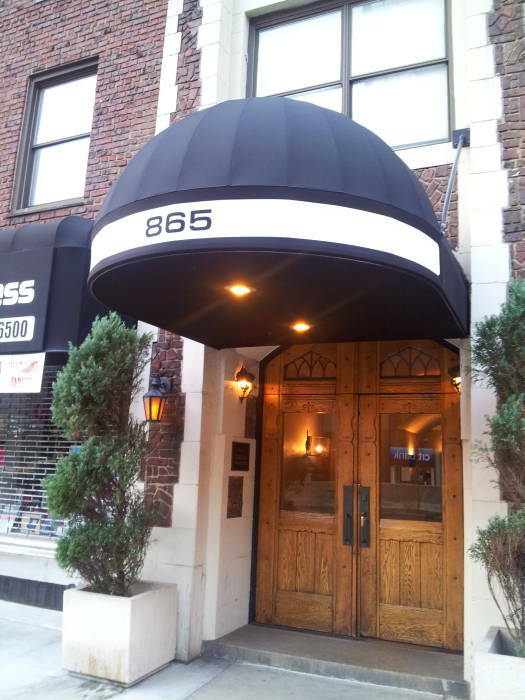 Its main entrance is on Fifth Avenue at 82th Street. It's very significant Impressionist collection has, at times, included Monet's San Giorgio Maggiore at Dusk, much admired by Thomas Crown and sought by Catherine Banning. Newland Archer and his wife's cousin Ellen Olenska had an illicit assignation here as described by Edith Wharton and Don Henley in The Age of the End of the Innocence. Stark Industries was founded by Isaac Stark in the 19th century. His descendants developed and directed the corporation as it produced munitions and worked on many other government projects through the two World Wars, the Cold War, and beyond. 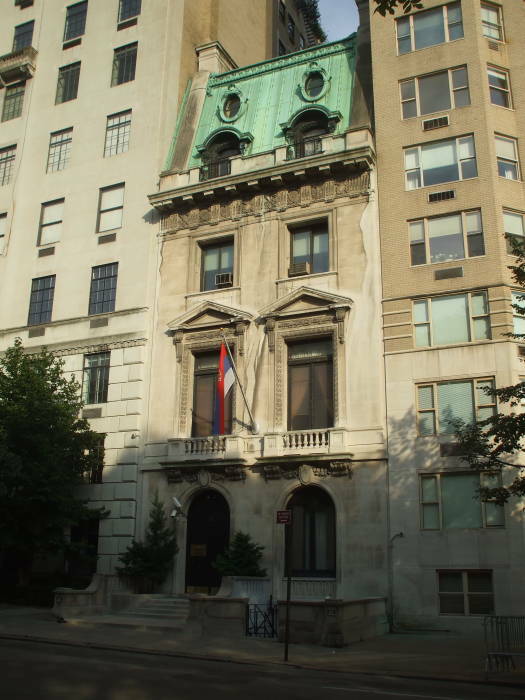 The Stark family mansion is at 890 5th Avenue, occupying the entire block between 70th and 71st Streets on the Upper East Side. In the 1950s, Isaac's descendant Howard Stark was involved in the founding of what became the Strategic Homeland Intervention, Enforcement and Logistics Division. Howard's son Anthony Edward Stark studied electrical engineering and computer science at MIT. He inherited the company and the family home after his father and mother, Maria, were killed in a plane crash. Anthony, better known as Tony, turned over Stark Manor to the Avengers and established the charitable Maria Stark Foundation. This foundation also funds the operation of the home, currently known as Avengers Mansion. The mansion has three floors above ground, as seen above, plus three levels below ground and strictly off limits to the public. Behind the outer walls, the grounds showcase an collection of statues crafted from adamantium. The legendary Hellfire Club is located just four blocks south along Fifth Avenue from the Stark family mansion, where East 66th Street meets Central Park. 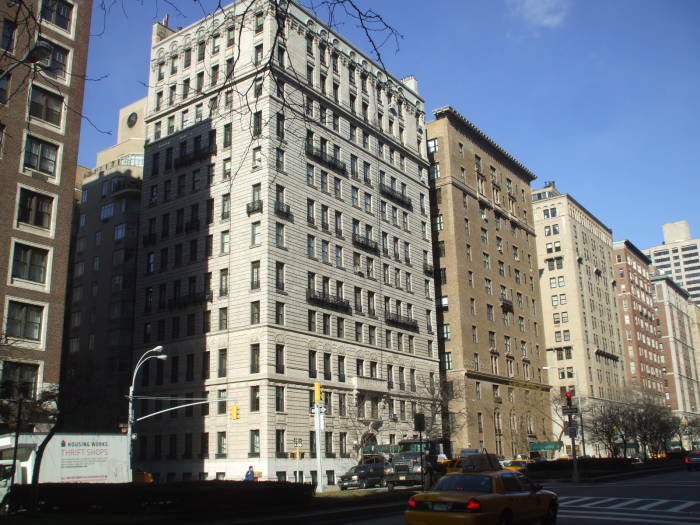 The buildings at left and below are on the northeast and southeast corners of Fifth Avenue and 66th Street. So-called "Hellfire Clubs" were popular in England in the 1700s. The most famous, founded in London in 1746 by Sir Francis Dashwood, became notorious for pagan and sexually risqué rituals. These exclusive clubs were rumored to be meeting places where "persons of quality" could indulge in immoral acts. As its members were often involved in high-level politics, the precise activities and memberships of the clubs remain largely undocumented. Benjamin Franklin is said to have attended Dashwood's clubs from time to time, although it is also argued that his presence there was as a spy for the American colonists. The club motto was Fais ce que tu voudras, or Do what thou wilt, later adopted by Aleister Crowley. Horace Walpole wrote that the club members' practice "was rigorously pagan: Bacchus and Venus were the deities to whom they almost publicly sacrificed; and the nymphs and the hogsheads that were laid in against the festivals of this new church, sufficiently informed the neighborhood of the complexion of those hermits." Meetings were held twice a month. The members wore ritual clothing: white trousers, jacket and cap, with their leader or "Abbot" in a red outfit of the same design. Sir Patrick Clemens and Lady Diana Knight emigrated from England to New York in the 1770s, founding an American Hellfire Club in an abandoned church building on this site. This exclusive society seems to be a social club for wealthy elites, less risqué than its English forebears, but it hides a clandestine Inner Circle that works to influence world events to their advantage. Sebastian Shaw and Emma Frost are prominently powerful members of the Inner Circle. The small central European country of Latveria is in the tri-border region formed by Romania, Hungary, and Serbia. 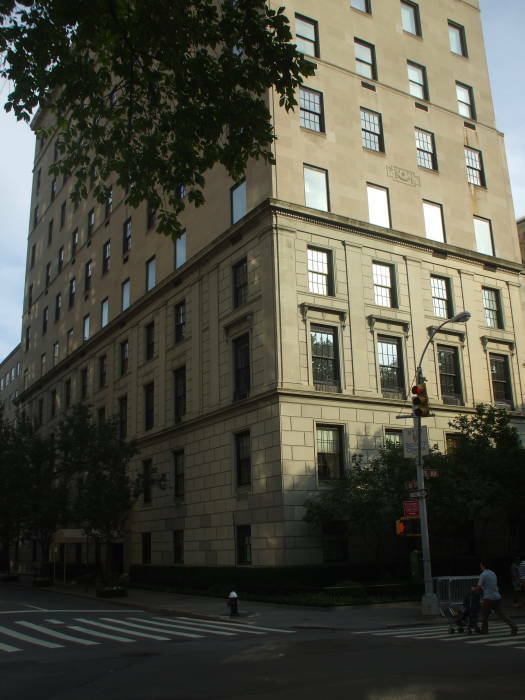 The Latverian Consulate to the United Nations is just a few doors north of the Hellfire Club on Fifth Avenue, between East 66th and 67th Streets. Latveria's government is an enforced monarchy with limited diplomatic relations with the outside world. SHIELD is currently operating under the name of the Strategic Homeland Intervention, Enforcement and Logistics Division. It was previously organized as the Supreme Headquarters, International Espionage, Law-Enforcement Division, and then as the Strategic Hazard Intervention Espionage Logistics Directorate. 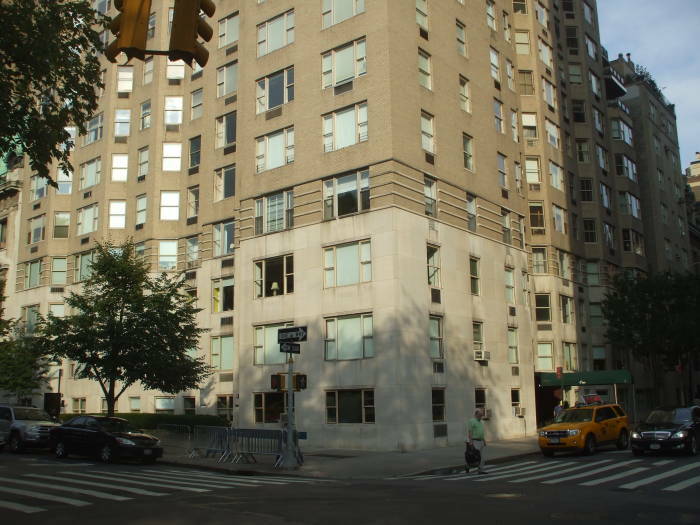 While SHIELD has a public office further northeast on the Upper East Side, its operational base in New York has its secret entrance near the corner of East 59th Street and Madison Avenue, the intersection seen here. The secret entrance to the operational base is through a barbershop near this corner. The SHIELD agents who work in the shop — Sam, Slim, and an unnamed woman — can quickly fog the windows with steam to block visibility from the sidewalk. Above we are looking west from the intersection along 59th Street, which is called Central Park South across the south side of the park. 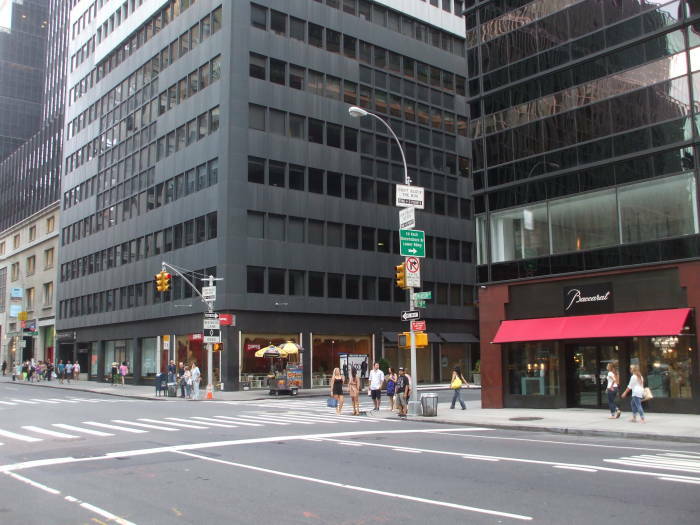 Fifth Avenue and the southeast corner of Central Park are at that first corner. 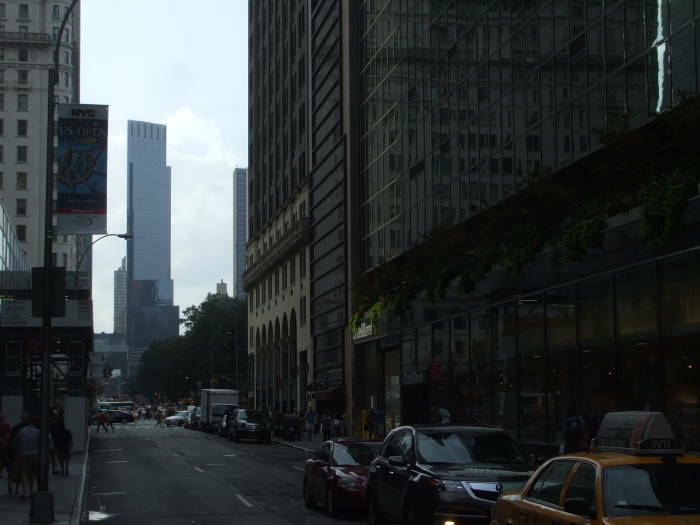 We can see Stark Tower rising above Columbus Circle just about one kilometer away. We will head that direction next. The SHIELD staff are said to be able to quickly disguise the barbershop as a hardware store to further frustrate adversaries' attempts to find the entrance. Given the difficulty of finding the secret SHIELD headquarters entrance as either a barbershop or hardware store, I think we can conclude that the camouflage system works quite well! 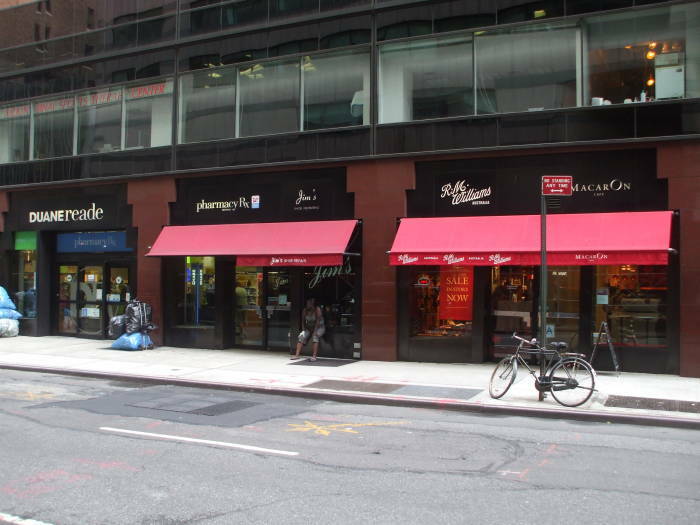 It is possible that the barbershop can also be disguised as a Duane Reade pharmacy, seen above on the south wide of 59th east of Madison, or as the luggage store or deli directly across the street. SHIELD was created after the end of World War II. Nick Fury is its executive director. He reports to a twelve-member council, but even Fury does not know their identities. The New York "SHIELD Central" facility is the largest land base, but the organization's headquarters and primary base is the Helicarrier, a flying aircraft carrier that is permanently aloft. 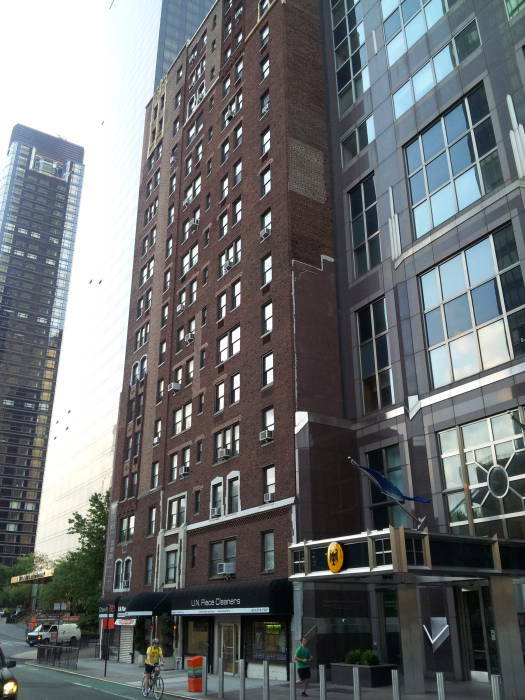 John Keller lives at 865 First Avenue, a short distance up from the United Nations between 48th Street and 49th Street.